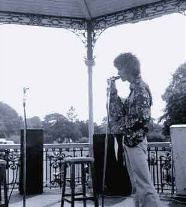 The festival was compered by the Beckenham composer David Bowie, who introduced top name groups to an estimated 3000 crowd. Among the local groups performing were Comus, who should go a long way with their distinct sound produced by a fusion of flute, violin and 12 stringed guitar. Gun Hill lacked perhaps the proffesional polish of Comus, but they obviously have a feeling for the blues. The Gas Works entertained with some sitirical songs but they also did some excellent blues, "Standing Stiff"' which featured harmonica, bottleneck guitar and Kazoo. "The Strawbs" are becoming well-known nationally and put over their own special band of protest song forcefully. Keith has been performing for about 5 years and has known the Arts Lab for about a year and it was Bowie who booked him. 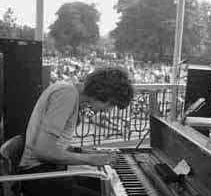 When asked was the Festival his biggest gig to date Keith said" A hard one that, as the festival was not very successful in terms of numbers and was a bit lacking in atmosphere - I was regularly doing clubs like the Troubadour in Bristol and Les Cousins in London which were far more demanding". 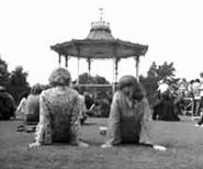 Many years later Bridget St John remarked "I remember the day in general - the pagoda-like structure - being outside and it being a beautifully relaxed and sunny day - I don't remember my set - but my biggest memory is that after performing a group of us went and listened with David to his test pressing of the single Space Oddity - it was quite amazing and we played it over and over - it was so remarkable". David Bowie himself put particular zest into his compostitions, battling bravely against troublesome loudspeakers. A friend Peter Horton, from Vienna, played a guitar performance of J.S. Bach's "Jesu, Joy of Man's Desiring. 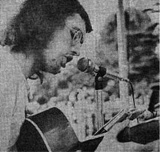 Mr Horton, who represented Austria in the 1969 Eurovision Song Contest. 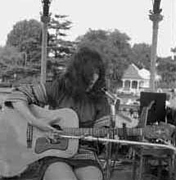 Also performing were Bridget St John, Appendix Part One, Comus, Nita and Dave Jones, Sun, Amory Kane, Kamirah, Giles and Abdul and Clem - a Beckenham Youth who played the sitar. The pre-concert blurb advertised John Peel, the Radio One D.J. and Junior Eyes appearing but Peel did not turn up and Junior Eyes were off doing a gig in Germany. But it did not turn out so bad as those who did appear more than compensated for their absence. But the lasting impession musically, was the Strawbs and Keith Christmas, they brought basic folk music with strong contemporary tones to the tiny band-stand. And Keith Christmas after an electric guitar solo swung into The Ballad Of Robin Head with gusto, enthusiasm and ability and was deservedley treated to the cheers of the audience. 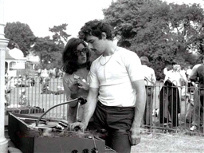 The DJ on the day was Tim Goffe and he remembers..."I was a medical student at the time living in a flat in Charlton and was also social secretary at my medical school and booked all the bands for the regular social events dances, balls and college folk club, as well as running a disco. I had some spare rooms in the flat and advertised them in the newly launched Time Out. To my surprise, one of the sub-editors at the time replied and before long, he and his wife moved in. His name was Bob Harris and he and I, very briefly, started and ran a disco together. So maybe I helped launch whispering Bob on his career, or maybe that's just fantasy on my part! Anyhow, he had a few friends in the music business including David Bowie and The Strawbs, and David's girlfriend at the time (later his wife), Angie, also was looking for somewhere to live, so she also moved into our flat and lived with us for maybe 4-6 months, so DB was a fairly frequent visitor! 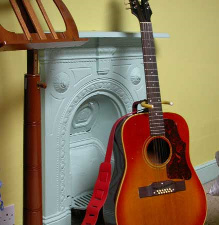 I played a bit of acoustic guitar at the time -I was never any good, but enjoyed singing in and visiting folk clubs - but had this rather nice 12-string, a Swedish Hagstrom, that was lying around the flat whilst I was at college. DB fancied it, borrowed it and played it for a while. 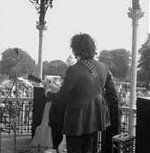 The picture of him at BFF shows him playing it and on the www.Hagstrom.org.uk website it is reported that he used it on Space Oddity. I'm not sure about that - I never discussed it with DB, but he gave me his 12-string, an old cherry sun-burst Gibson, for my Hagstrom in a straight swap. It was the Gibson (left) that was used on Space Oddity. I have often wondered what happened to my old Hagstrom and whether DB has still got it, or who has it now. Incidentally, he told me that the Gibson previously belonged to Pete Townsend of The Who. I can believe that, because it was in poor shape when I got it and it never played well. I did book David as a live act for a college "Hop" (The London Hospital Medical College, Whitechapel) around the time of the launch of Space Oddity -a sell out. Scattered around the perimeter of the park were the other essentials that make a happening happen. 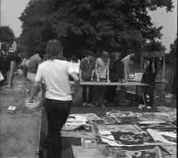 Growth recouped the money they had put into the festival from a barbecue, exotic tea, candy floss, the Tibetan Shop, The Culpepper herb and food stall, astrologers, mystics, fortune tellers, Tarrot readings and a poster stall. Dave Grozier and Pete Logan sold rings made from aluminum. The Barbara Cole and Brian Moore puppets performed a show for adults. The colourful puppets manipulated by Saskia Thomas, Dave Neill, Cledwyn Hughes and Dave Bebbington. The smell of incense filled the park and the pink candy floss clashed with the bright colours of the Kafftans, cloaks and elaborate head-dress of the audience. 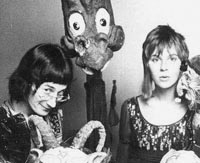 Freaked-out youths convulsed rhythmically to the harsh beat of the pop groups, while bead-bedeckled appreciators tapped their feet to the folk artists, or drooled lovingly over their Eastern Scene Man. In the crowd were twin sisters who had traveled from Harrow. One of the organisers Mary Finnigan said "The Festival had been a great success. All the visitors were well behaved". I tried tracking you down when I was putting these pages together. If you have anything that you would like to contribute contact me via the site. Hi I also used to play sitar at the Arts lab in the Three Tuns on a Sunday evening. Bowie used ask me to come down and do a spot. I used to live just along the road from there. It was quite a scene in those days and full of new stuff. Noel Redding was undoubtedly a talented bassist...but "Superstar"? No. Lovely memories David. I was the manager of Gas Works. David Bowie got to know of us when we provided the improvised music for a one-man mime and dance show at the Drury Lane Arts Lab by The Great Orlando (Lindsey Kemp's partner). 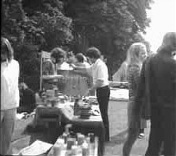 Bowie then invited Gas Works to play at the Beckenham Arts Lab several times and they also played at the Free Festival. When Starman became a hit in America we were invited to the big house for a party to welcome David home from the States. He travelled home by theTrans Siberian Railway. He was scared of flying. We met Tony Visconti at the party and when Tony got his first independent deal to make records his first two artists were Sparks and Gas Works. There's an appreciative and truthful paragraph about his involvement with Gas Works in his recent auto-biography.